I DON’T LIVE HERE ANYMORE IS A SERIES OF 4 ABSTRACT PHOTO-PAINTINGS CREATED USING DIGITAL & PHOTOGRAPHIC MANIPULATION. THEY’RE FUN, COLOURFUL, AND COMPLETELY UNPRETENTIOUS (AT LEAST TO ME). ALL 4 ARTWORKS ARE SOLD IN EDITIONS OF 100, STARTING AT A PRICE OF US$8. AS MORE EDITIONS ARE SOLD, THE PRICE WILL INCREASE INCREMENTALLY, SO COLLECT/PURCHASE EARLY. THE ARTWORKS ARE LIMITED EDITIONS AND EXIST AS SUCH IN THE DIGITAL FORMAT. YOU WILL BE ABLE TO VIEW THE ARTWORK THROUGH YOUR PHONE, TABLET OR DESKTOP. ESSENTIALLY, YOU BECOME A DIGITAL ART COLLECTOR. BE THE FIRST TO SEE THE ARTWORK BEFORE ANYONE ELSE FOR A PERIOD OF 24 HOURS, BEFORE IT GOES LIVE TO THE PUBLIC DOMAIN (MEANING THE REST OF THE WORLD). 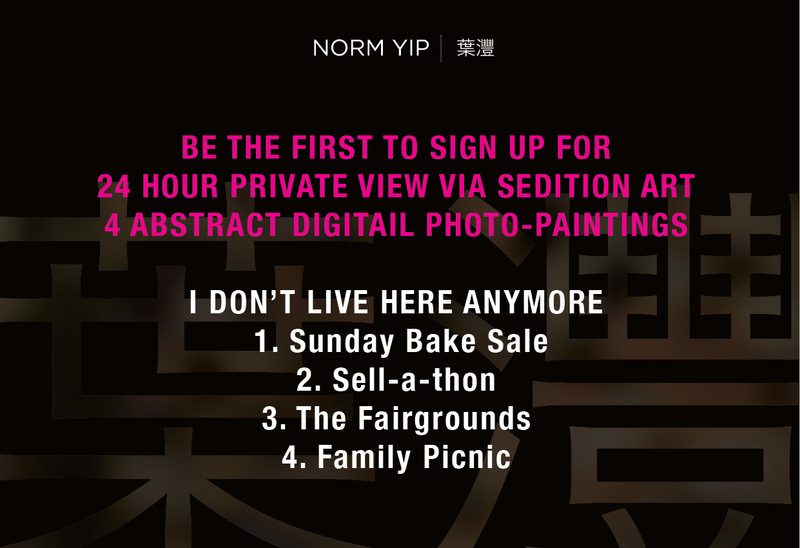 SHORTLY THEREAFTER, I WILL BE RELEASING THE FIRST OF THE 4 PAINTINGS VIA SEDITION ART.